Blackstone's Police Investigators' Q&A 2012 consists of over 200 multiple-choice questions designed to test trainee investigators studying for the National Investigators' Examination (NIE). 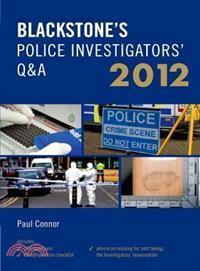 The Q&As are arranged in the same order as the chapters in the Blackstone's Police Investigators' Manual 2012 , to aid learning and check understanding. This book also contains a useful section on how to study for the NIE, including advice on how to approach multiple-choice questions and useful exam techniques. All the multiple-choice questions contain answers with detailed explanations and references back to the Investigators' Manual. The book is designed to reinforce knowledge and understanding of the NIE syllabus. The NIE is a paper based Multiple Choice Question examination testing knowledge of law and procedure relevant to the role of a trainee investigator (in the areas of Evidence; Property Offences; Assaults, Drugs, Firearms & Gun Crime; and Sexual Offences). This Q&A book will help to highlight any gaps or weaknesses in that knowledge. Fully updated for 2012 to include coverage of new legislation including the Crime and Security Act 2010, the Equality Act 2010, the Coroners and Justice Act 2009, the Policing and Crime Act 2009, and the Violent Crime Reduction Act 2006.